A particularly impressive 3 bedroom detached house extended to the front and substantially extended to the rear in 2015 to create a fabulous light and airy kitchen/dining/family room as well as a utility room and study. 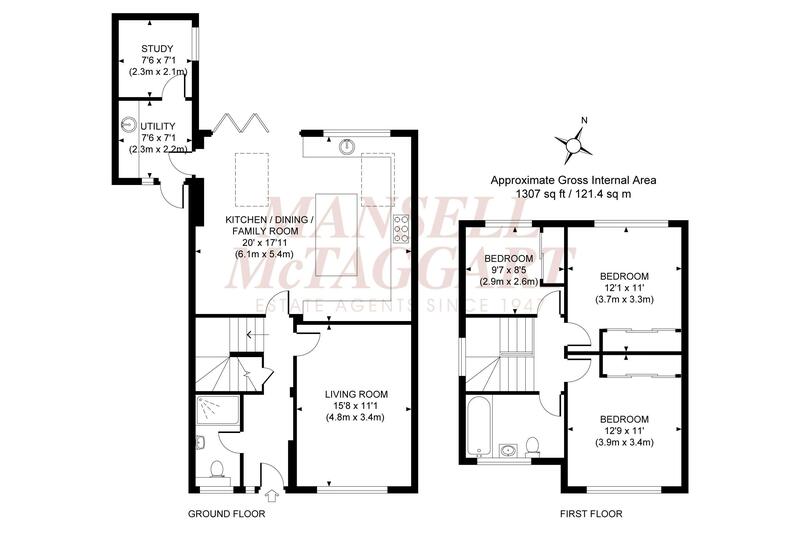 The property is situated in a small close on the ever popular Folders Lane development. Birchwood Grove Primary School is less than half a mile away and the mainline station is within 0.7 of a mile via a pedestrian footpath through Silverdale Road. The accommodation now includes an entrance hall with a cloaks cupboard, stairs to the first floor and a cloakroom/wc leading off it. The living room faces the front aspect. A particular feature however is the generous kitchen/dining/family room featuring a part vaulted ceiling with inset skylights and bifold doors opening to the garden. The kitchen has been fitted with a range of white cupboards complimented by Quartz stone worksurfaces as well as a central island with ample seating, cupboards beneath and an integrated wine cooler. There is also an integrated dishwasher. A utility room leads off this room, also fitted with white cupboards, a sink unit and plumbing for a washing machine/dryer. A door leads to the front driveway and to a study which overlooks the rear garden. On the first floor there are 3 bedrooms all with built in wardrobes and a bathroom refitted with a white suite in 2014. Outside a long private driveway provides ample parking divided by central gates. The west facing 30’ wide x 25’ deep rear garden is laid to full width timber decking with inset lighting and outside tap. The remainder is laid to lawn, enclosed by panelled fencing. A superbly extended 3 bedroom detached house with the benefit of a full width kitchen/family/dining room. Burgess Hill is surrounded by picturesque countryside and historic landmarks; offering plenty of local amenities; with great connections via road, rail and air. The town centre offers a variety of shops, cafés and restaurants; there is a local cinema, playgrounds and parkland, sporting facilities including the popular Triangle Leisure Centre and clubs for anything from bowls to yoga. For families looking to move, Burgess Hill is an ideal choice with good schools, plenty of outside space and activities to keep families of all ages entertained. Well Connected There is so much within easy reach, from the city of Brighton, to historical Lewes, to the far reaching South Downs. Easy access to London and Brighton ensures family days out are popular and commuters are well catered for. There are frequent trains from Wivelsfield and Burgess Hill to London Gatwick, London Victoria, London Bridge, London St Pancras International and Brighton and it is just a short drive to access the A23 at Hickstead, from which it is a short drive to Brighton or north to Pease Pottage to pick up the M23 for the M25. Schools: Birchwood Grove Primary School 0.4 mile. The Burgess Hill Academy 1.1 mile. N.B Please note that catchment areas need to be confirmed. Stations: Burgess Hill Mainline Railway Station (London Victoria/London Bridge approximately 54 minutes and Brighton 15 minutes) 0.7 mile via a pedestrian footpath. Situated in this small close within 0.4 of mile of Birchwood Grove Primary School and 0.7 mile of the mainline station.